‘Both Sides Now’ is Naturally 7’s seventh studio-album and represents a further remarkable development for the renowned vocal-group from NYC. Some of their previous biggest successes were notable interpretations of world-hits from Phil Collins’ ‘In The Air Tonight’, Coldplay’s epic ‘Fix You’ to their self-penned‚ ‘Wall Of Sound’, all of which they performed during 3 world-tours with Michael Bublé in 467 shows to over 4 million people in 25 countries. 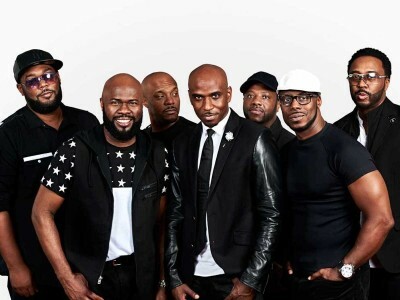 This new album features wonderful rich harmonies and warm voices, combined with Naturally 7’s unique talents to perform a variety of instruments simply with their voices. The album contains classics spanning over many decades from Anton Dvořák to Britain’s most patriotic hymn ‘Jerusalem’, to Roberta Flack’s ‘First Time, Ever I Saw Your Face’, Sting’s ‘Shape Of My Heart’ feat. YouTube’s a cappella star Peter Hollens, Paul McCartney’s ‘Pipes Of Peace’, Joni Mitchell’s ‘Both Sides Now’, all the way to a very special version of Adele’s ‘Hello’, as well as the group’s original song, which always closes their live-show: ‘Caught in the Moment’, feat. Pentatonix Kevin Olusola on cello. …and that is the only instrument you’re about to hear on this new masterpiece from the A Cappella-Kings.